During the financial aid application process, you can begin setting up aid awards for the student. When you're working with Federal Student Aid (FSA), this process is called packaging. When working with FSA, the packaging process is used to meet the student's financial need. The main stricture, in the words of the FSA handbook, is that "the student’s total financial aid and other Estimated Financial Assistance (EFA) must not exceed the student’s financial need". You can use any kind of aid award to meet the student's financial need. 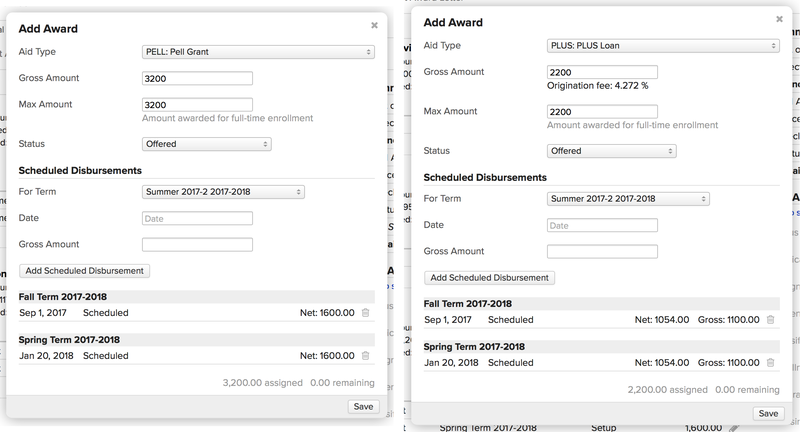 If you're not using FSA—say, if you're just offering merit-based institutional scholarships—then you can set up aid awards at any time, whether or not you use the aid application features. If you accept FSA, you will need to have begun with an aid application so you can award aid based on the financial need calculation. The application does not need to be set to accepted before you beging setting up awards. Here's how to add any financial aid award to any student. Make sure you have the correct aid year selected. Next to Awards, click add. Select the aid type. You can choose any award to which you you have linked a liability account (for Federal Work Study, you'll need to set up an asset account as described in this article). If the aid type you've selected is linked to an aid year schedule, a disbursement schedule will appear at the bottom of the dialog. More details below. Enter the award amount. This will also fill in the max amount, which is typically the same number for full-time students. If the student is other than full-time, then the two amounts may differ. If you selected Pell Grant as the aid type, the amounts will auto-fill based on the student's COA and EFC. Setup: You're still figuring out the award details and don't want the student to see it yet. Offered: The student has been informed about the award and can now make a decision about it. Accepted: The student accepted the award (or, for loans, a portion of it)—either by using the student view of the aid application or informing you through some other means. Declined: The student has declined the entire award. If the award type is not already connected to an aid year schedule, you can schedule its disbursements. Disbursement dates are shown as estimates to students. Because these dates may figure into the student's decision, you should add a disbursement schedule as soon as possible. Select the term the disbursement will be used to pay the student's charges. Enter the date of the disbursement—this date doesn't necessarily need to fall within the term. For FSA awards, consult the Handbook for disbursement guidelines. Enter the amount to be disbursed on that date. Keep an eye on the amount remaining as you schedule multiple disbursements. When all the details have been entered, click Save. You can find the award and any disbursements in the respective reports in Financial Aid > Awards view. Any disbursements will be in setup mode (until the student accepts the award). You can modify or delete the award and/or any of its disbursements (see below). You can change any part of an award at any time, save for a disbursement that has been posted. If you're using FSA, changes to accepted awards (and their disbursements) will need to be synced to COD. Click edit award to change details like amounts, status, and any COD items requiring update. You can also delete the award in the edit dialog. Edit an individual disbursement by clicking . Among other things, you can specify the invoices (if any) to which this disbursement will be applied. Click add disbursement to add a disbursement to the schedule. If the changes you've made to the award or disbursements result in a discrepancy between the award amount and the total disbursement amount(s), you'll see an underaward/overaward warning. Before disbursing or syncing with COD, you'll need to modify the award or disbursements until that warning goes away. Click edit award; in the dialog box, change the status to offered. Click offer all setup awards. After doing either of the above, the student will be able to see these awards on his Profile > Financial Aid view, where he can accept or decline them. The detail view of an award shows you its complete history—changes, notes, COD syncs (if any). You can add new notes in the text area at the top. To disburse the funds, you'll need to run a batch.